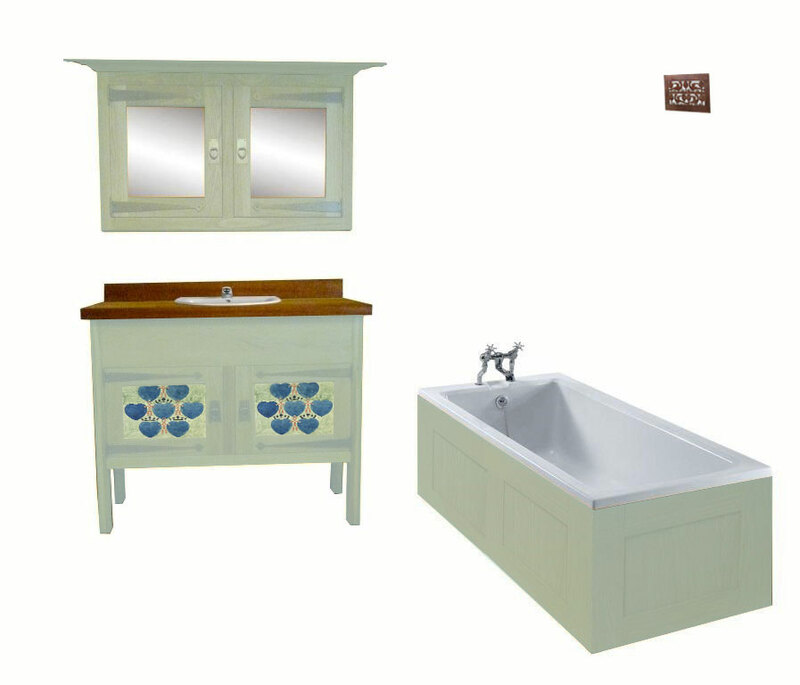 Some new oak bathroom pieces form a new Voysey bathroom suite. These are the essential elements in creating a Voysey style new bathroom, the additional elements fit in around these, ie shower, WC, towel rail/radiator, etc.. These are what give you the look. The vanity unit looks like a piece of freestanding furniture, but is fixed & plumbed in. The furniture has all the typical Voysey elements; long strap hinges, Heart handles, medium oak finish, shaker panels. The worktop could be a stone (marble or granite) worktop. 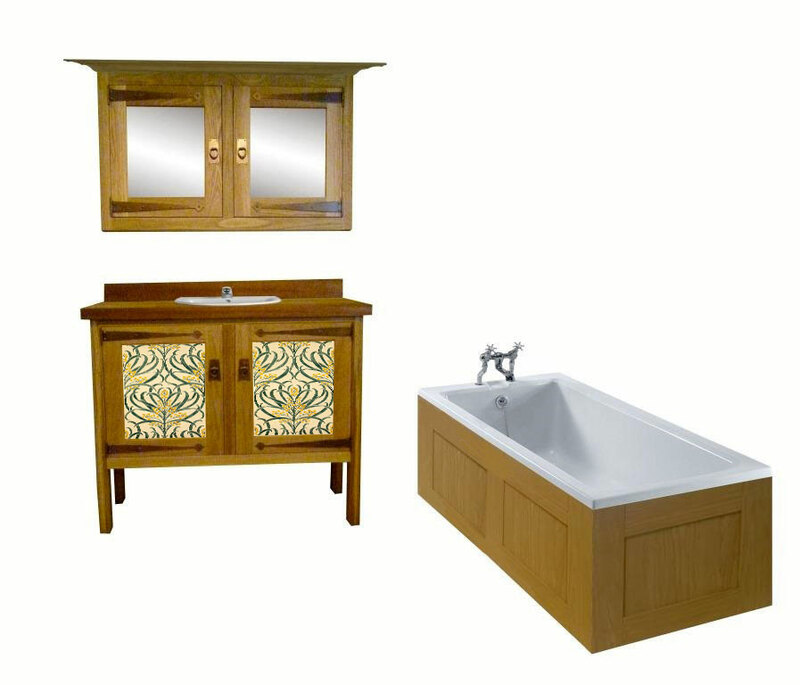 The matching wall unit above gives you plenty of storage as well as providing good mirror area, and looks very elegant. The large ornate cornice is typical Voysey, but could be omitted for a simpler cleaner profile. Shown above the bath is one of of our Voysey Bird air vents, which you could use for the extractor cover. We've shown a lot more design variations of this suite below. The above photos show several ideas for Voysey bathroom furniture with decorative panels. The furniture shown is oak, although it could have a painted finish - see below. These are just a few of the many typical Voysey designs we could use. Made to order. The above variations use Voysey's 'Bird' air vent design for the various panels. The Bird designs only work if the vanity has the top blanking panel, to keep the door panel proportions correct. The above photo tries to show you how this suite would look with a coloured finish. Voysey was no stranger to painted woodwork & furniture, these photos aim to give you some new ideas for the treatment of the bathroom furniture. It doesn't have to be oak!